Cut into thin slices along the length of the eggplant (consider that you have chosen to fill the entire mold and the entire top surface)Just fry in hot oil. Alternatively if your filling is too rich in calories, you can grill the eggplant on a grill. Season with salt. But in this case, you should remember to grease the mold of eggplant before dressing. 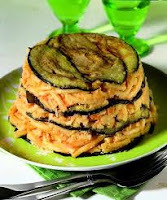 Coat the mold with the slices of eggplant, leaving no gaps. In addition, the slices must oozing from the mold (You will need to reseal the surface once filled with stuffing.) Filling, then filling the mold of choice mixed with a handful of grated Parmesan cheese. Fold sides toward the center of the eggplant that stampi.Utilizzare oozing from some other slice kept aside to cover the entire surface of pie. Finish with a drizzle of extra virgin olive oil and brush evenly on the surface of the oil with a pastry brush. Bake at 180 ° C - 360 F for about 20 minutes. allow to cool before you unmold the mold. You can also prepare individual portions in small molds.